I‐CAR, the Inter‐Industry Conference on Auto Collision Repair, announced they will continue to bring relevant vehicle technology discussions to the forefront of the industry at SEMA 2014. Attendees will experience noteworthy presentations and live demonstrations on the topics and trends impacting the collision repair industry today and in the future. I‐CAR’s Jason Bartanen, Director of Industry Relations, will lead a full schedule of speakers at I‐CAR’s SEMA Collision Repair & Refinish Stage where collision repair professionals will learn about the latest vehicle developments they must understand in order to perform complete, safe and quality repairs. Bartanen will also present during the week offering insights on advanced vehicle technology and the technical services I‐CAR offers, drawing from his role leading I‐CAR’s technical team, hosting Structural Repairability Summits and OEM Industry Segment Advisory Council meetings. Jeff Peevy, Senior Director Collision Repair Segment Development and Field Operations, will deliver a captivating presentation on how a ‘Learning Culture’ can transform this industry. During this session on Thursday, November 6, Peevy will share research statistics on the proven relation between collision repair training and improved business performance, and share insights on how industry leaders are turning their training investment into sustainable competitive advantage. I‐CAR has also lined up repairability‐related presentations from Ford on the 2015 F‐150, BMW on carbon fiber and aluminum structural repair, General Motors on the Corvette Stingray and HD truck, Honda on the Acura high‐strength and ultra‐high‐strength steel repair guidelines, and Audi on repair technology. In addition to I‐CAR and OEM presentations, the jam‐packed schedule on the I‐CAR stage includes Abaris discussing carbon fiber repair, Spanesi covering 3D measuring, ProSpot and 3M presenting on rivet bonding, and Elektron sharing insights on aluminum MIG welding. In addition to delivering technical training presentations to collision repair industry professionals, I‐CAR will be offering some of its newest and most popular courses, including Vehicle Technology and Trends 2015 (NEW15), to help support repair businesses achieving or maintaining Gold Class® recognition. 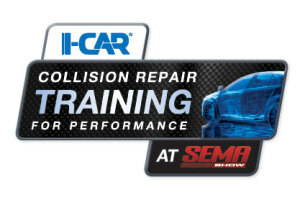 To register for I‐CAR training courses at SEMA visit www.semashow.com/education.